So what is it about Fundilia that makes her so special? Annie: Well originally she was going to be my MA dissertation topic, but the more I looked at her and the more I read about her, the more I realised I could get a lot more than that out of her. I also chose her so I could have something local that I could get my hands on. I wouldn’t have to go down to London or rely on books. I wanted something which had a real local significance. When was the first time you saw her? I must have been a second year undergraduate when I first heard about her. I was sent an email by Katharina [Lorenz, of Nottingham University Classics department] about going to see ‘Fundilia’. I thought we were going to see a person! Afterwards everyone was coming back saying “I’ve been to see Fundilia”, and I was like: “Who is this Fundilia? !” Honestly I thought she was a person who worked at the museum … with a really unusual name! The first time I went to see her was after I’d seen photos of her in books, which really did her no justice. I got in touch with Ann Inscker [curator at Nottingham Castle Museums] to ask if I could have a look at her. When you first see her she sort of looks like a witch. I think initially I was drawn to her because she’s so … I guess what we would call conventionally ugly. She’s not your typical ‘Latin lovely’: she’s no Livia or Venus. Then the more reading I did and the more I actually looked at her the more I realised how fascinating she was. There’s stuff about her we’ll never understand because she works on so many different levels. Detail of Herm of Fundilia, Copyright Nottingham Castle Museums. Do you think the real Fundilia looked like that in real life? No. Because we use the word ‘portrait’ I think you initially think, ‘oh it must be a likeness of someone’, but it’s very hard to judge. We should see the portrait as a construction: her forehead is a high status male Claudian forehead. So once you’ve got used to the visual impact of the forehead, you realise it’s about showing her high status. She also has quite severe ‘Venus rings’ incised around her neck, which was a Roman mark of beauty. We have to understand what this means. Being ‘pretty’ is one thing, portraying beauty is another thing. Someone is portraying her as a very high status person, and they’ve used a male characteristic to do it, yet they’ve incised her throat with ‘Venus rings’ which is a mark of female beauty. It’s very hard for modern viewers to peel all their preconceptions away. Also we have to realise she looks a bit funny because she was buried underground for so long. She would have been painted, which I think would have helped enormously. Her hair would have been painted; her face would have been painted; the drapery on her clothes would have been painted. The feet Ann found are definitely her missing feet. Obviously they’ve become detached, you can see the crack behind the feet when they were removed. There was a landslide at Nemi, and that’s why she’s so damaged and all the sculptures in the room with her were underground for such a long time. It’s highly likely Fundilia’s feet came off at this time. Why doesn’t she have any arms? She did, but like the feet they’ve fallen off. But why they haven’t found the arms like the feet is a more interesting question. As a herm, the arms would have been separate, you can still see the pins in her shoulders which would have held the arms on. They could have been made of wood, and so have rotted away. They would have been arm stumps which you could have hung garlands from. 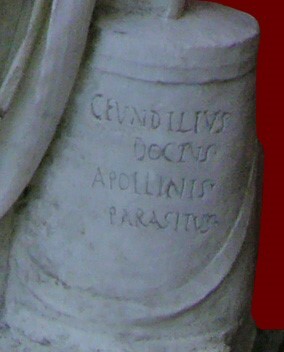 Herm of Fundilia, detail. Copyright Nottingham Castle Museums. What can you tell us about her very unusual hairstyle? It’s kind of like a deconstructed nodus. Like the topknot which Livia [wife of the first emperor Augustus] had. Fundilia has the bun moved to the top of her head, and changed slightly. 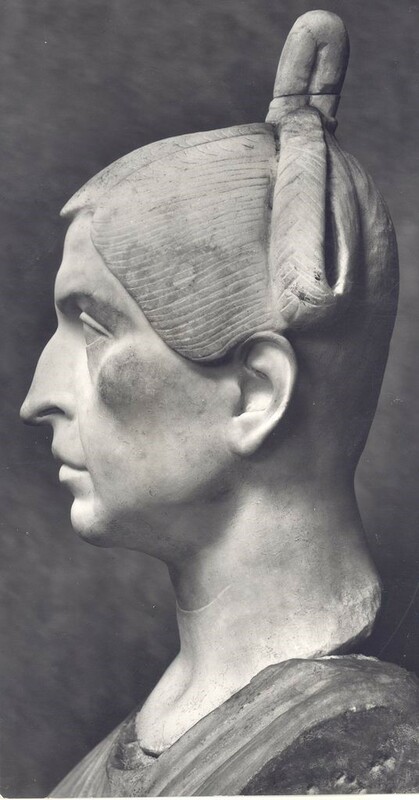 It’s a traditional Roman hairstyle from the late Republic, which is much earlier than Fundilia. 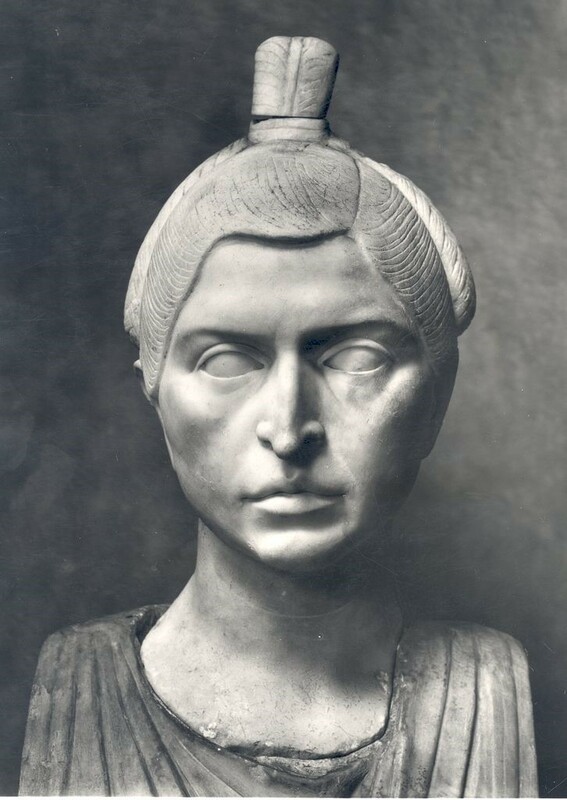 It’s an interesting question as to why a woman in the Claudian period has this early Roman style, as Roman ladies were normally really up-to-date with the latest hairstyle fashions. The other women from the room where Fundilia was found has pretty contemporary, modern hairstyles. So she’s a woman who liked to look different? Yes, it would have given her gravitas. What was the motivation behind this sculpture? Did she decide to make it? It was dedicated by her freedman, her ex-slave called Fundilius. He dedicated a statue of himself [now in Copenhagen] and two, possibly three of Fundilia. They were possibly originally at different locations around the temple complex, maybe one near the theatre. But to say that he’s a ‘slave’ is a bit simplistic. He calls himself ‘Doctus’, which means ‘learned’, and he calls himself ‘Apollo’s parasite’, meaning an actor. His statue is a lot more expensive than Fundilia’s full-size statue [also in Copenhagen]. It’s a lot fancier. The herm of Fundilia [in Nottingham], on the other hand, is absolutely amazing and outstanding. There’s no other herm like her from the Roman world. Statue of Fundilia. Ny Calsberg Glyptotek, Copenhagen. Barbara F. McManus CC. So there was a cheap full size statue of Fundilia and a really expensive herm? Well the herm has amazing features. It actually has uneven breasts, which was a feature of large-scale female sculpture. A herm was more fitting in a sanctuary context, it likely would originally have been near the temple of Diana. 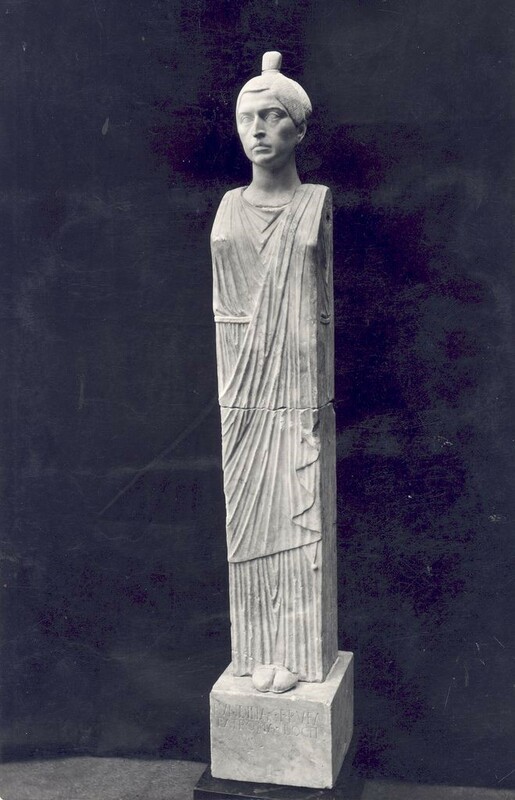 It looks like Fundilius came into lots of money, or became more famous or rose in society, and then decided to put up some more statues, and just went to town on his own full-size, and got her a fairly average one! But the herm of Fundilia is of such incredible quality that it would have been very expensive. Is it unusual to have a female statue in a sacred place? Is she a votive? Not a votive to a goddess like Diana. It’s more of a dedication to Fundilia herself from her freedman Fundilius. Provenance is, of course, a huge issue. 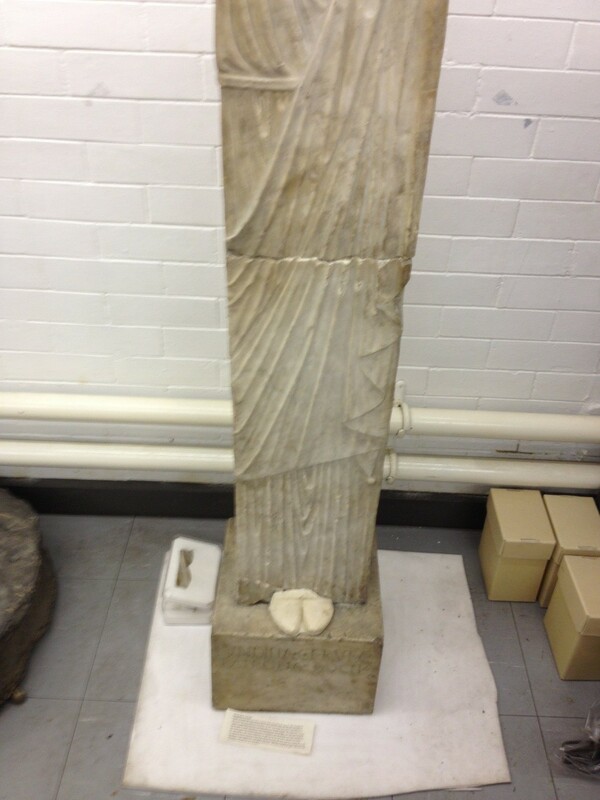 The statues clearly didn’t originally come from the room with the mosaic where they were found in excavations. The full-size statue was probably in or near the theatre at Nemi, and it’s quite nice to think that Fundilius’ statue was also originally there too as it would fit well with him being an actor. I think all the statues were collected from all around the sanctuary at a later point and put into this room so that more statues could be set up in Diana’s sanctuary. So Fundilia may not have had any say in the creation of this herm. Does this mean that she was the vehicle for someone else’s ambitions? She clearly had a status of her own, but Fundilius has used her as his vehicle. He took his name from hers, and used it all over the statues. As a freedman, Fundilius needed a lineage to point to, and that’s what he’s got with Fundilia. She’s a surrogate mother, possibly wife. Fundilia isn’t mentioned as anyone’s wife or mother [the key definers of Roman womanhood], only as a daughter. So she’s nobody’s woman, apart from Fundilius’! What kind of status would an actor like Fundilius have had in Roman society? It’s really unusual to have an ex-slave actor with this amount of resources. What’s interesting about him is how he goes to great lengths to portray himself as an orator, and yet has two inscriptions stating that really he’s an actor. So why doesn’t he just portray himself as an actor? In reality actors were a bit dodgy in Roman society, associated with prostitution and the like. He’s obviously showing himself instead as a serious, serious actor. Nemi is a very interesting case for showing social mobility in Roman society. With the Via Appia door to door between Rome and Nemi everyone had increased mobility. It’s only about 17km. Nemi was where all the Roman aristocrats had their villas, so there were a lot of very ‘proper’ people there. Nemi town boomed with the temple complex – they had their own granaries, minted their own coins, there were money-lenders. The people there were ridiculously rich: there would have been silly money in Nemi. Like some sort of South Riviera of antiquity, where the very very rich would come: royalty, and then slowly the A-list celebrities would catch on, and so on. Fundilius and Fundilia aren’t royalty: they don’t have imperial connection, but they’re A-list celebrities of Nemi. Rebecca Usherwood & Annie Evans are doctoral researchers at the University of Nottingham.